Worried. Anxious. Undecided . All these words described LaTisha as she “googled” to find a place where she could talk to someone about her unplanned pregnancy. She had miscarried the year before and felt there was no way she could go through that emotional turmoil again. Even though she and Chris had been in a committed relationship for over 6 years, LaTisha wasn’t comfortable with the possibility of another pregnancy. Through social media she found the Uptown Women’s Center and called for an appointment. Chris was worried about this possible pregnancy, too. He was concerned for LaTisha and her anxiousness and wondered what they should do if they found she was pregnant again. 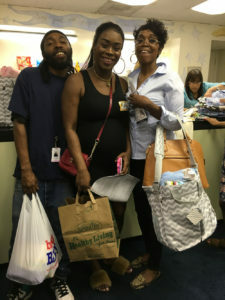 So he was pleasantly surprised when they walked through the door of the Uptown Women’s Center and found such a warm environment and kind staff who was as concerned about the pregnancy as they were. LaTisha soon was relaxed as she was introduced to the many services available to her. “They were all so helpful! They make you feel really comfortable and told me I could call anytime with questions.” She was given all the information she wanted regarding prenatal development, healthy pregnancy and a sonogram that confirmed she had a viable pregnancy with a baby whose heart was beating just as it should. And, although they were not first time parents, Chris and LaTisha learned about the educational prenatal and parenting classes that they could participate in at our Downtown location. What intrigued both Chris and LaTisha were the classes offered for fathers-to-be. LaTisha secretly hoped that Chris would pick up some tips so he would be more involved, while Chris hoped if they both attended classes that LaTisha would be less anxious about the pregnancy. God must have surely been smiling as He heard the desires of each of their hearts — for each other! On October 6, 2017 Chris and LaTisha gladly welcomed 8 pound 10 ounce Vavion Demetric into their family. What a joy it has been for the staff at Involved for Life to invest eight months in helping Chris and LaTisha to move from being fearful to feeling fantastic as parents of their new son! “I was single. I was pregnant. And, I didn’t know what to do. People around me were telling me to abort.” But Samaria hit the internet looking for someone to help her with her pregnancy. “The Downtown Pregnancy Center welcomed... Read More. Looking for Love in All the Wrong Places” – Tiffany’s Story The lines from this old country song express a sentiment that is understood by many of us. And, while this expression represents the search of many of our clients,... Read More. When the nurse performed the ultrasound, the scan showed a very small developing preborn that was just six weeks old. Then the baby’s heartbeat came up on the screen, and the tears began to flood down her face. Joy found... Read More.